There can be a lot of expectations when you go watch one of your favorite bands live for the first time. This was certainly the case as I made the trip to Stubb's Waller Creek Amphitheater in Austin to see a show featuring the Josh Abbott Band, Sam Riggs and the Night People and Flatland Cavalry. When Flatland Cavalry's debut album was released, it shot to number #1 on the iTunes country music charts, beating out Chris Stapleton among others. 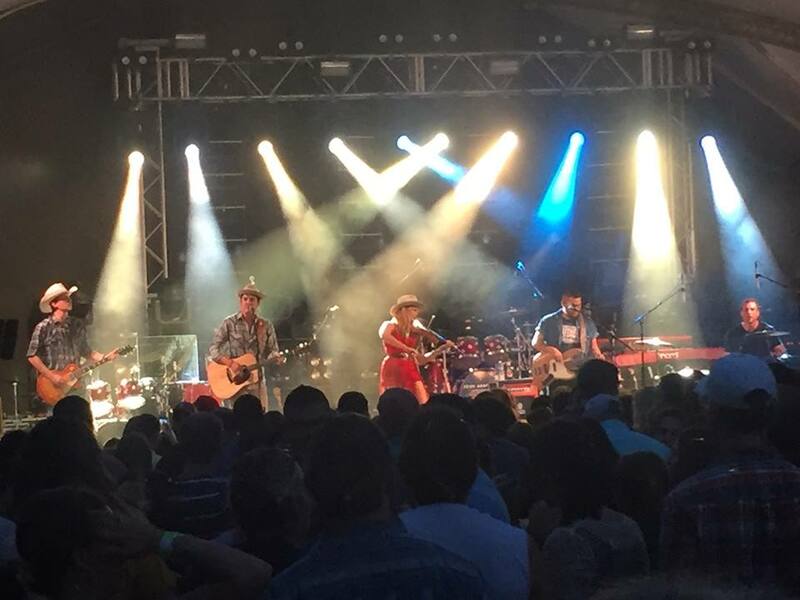 With the cosigning of William Clark Green, Randy Rogers, Josh Abbott, Dalton Domino and others, there was some added fan pressure for them to live up to a standard set by Lubbock artists before them. As I walked in to Stubb's, there was an electricity in the air. People began to flock to the front of the stage, patiently waiting for the show to start. Time began to pass and at 8pm on the dot, Cleto Cordero and company walked out on stage. Drummer Jason Albers began the bass kick as they kicked off their show with Coyote (The Ballad of Roy Johnson). Flowing flawlessly through the verses and chorus, we began to be taken to a desolate area on the border where Roy waited patiently to take immigrants across the border. As soon as we made it across that Rio, we were immediately slowed down. Moving into February Snow, Cleto reminds us to not call your girlfriend a bad name. Generally, she might tend to break up with you and you will be left missing her. February Snow lets us get a real nice dose of Laura Jane on fiddle. As he sings the hook, you can hear the emotion as Cleto sings "I really wish that you'd come back," you get taken to a spot in your past where you MIGHT have messed up just a little bit. During the last two songs, the harmonies begin to take center stage as Johnny Saenz, bass, takes the background and accents the top laid down by Cleto. This becomes a pleasant trend for the rest of the night. Going into their fourth song, the crowd around us begins to get invested more and more into these young upstarts from Lubbock. At this point in the night, we are addressed and given a little back story from Cleto. "Earlier this year we released our first album. It went to number one on ITunes and beat out Chris Stapleton, so that's cool. We just recently sent out our second song to radio, here's - One I Want." This is where we begin to see the apex of their set. One I Want sets the crowd a blaze and everyone has their phones out, recording the moment. Reed Dylan, the lead guitar player, gets a ton of shine on the live version of this song, as he and Laura Jane take front and center with extended solos, longer than the usual album version. They take it back to their first EP, Come May, for the next track "No Shade of Green." Before the song, we hear the story of being down in College Station for a Turnpike Troubadour concert, and Cleto sees a girl with blonde hair, green eyes, and red lips dancing on a cooler. Thing is, he can't remember her name. On the way back to Lubbock with Roy Johnson, his best friend, he wrote the song for her. When we get back to Lubbock we go to his old Stompin' Grounds. The crowd, at this point is getting familiar with the band, as their set begins to wrap up. With the mentions of Charlie Daniels and Waylon Jennings in the lyrics, applause get louder. With this being the last song, we are introduced to each band member as they play a solo before they head off for the night. As they end the evening, its clear to see that they have gone from a band a few people in attendance had heard about, to one that has made many new fans. Now if I can get personal for a second, and get away from the traditional "review" of the concert to express my thoughts. I had high hopes for this night and I was not disappointed. Cleto Cordero is a true showman and able to control a crowd as a lead singer with the best of them. From slight narration and storytelling between songs to frame the next track to commanding the stage, he can do it all. Its a little funny to me that they pay homage to Turnpike in the song "No Shade Of Green" because I feel that they will be the next band to come from Texas to make it as big as Turnpike is right now. Their instrumentation is amazing. Laura Jane is as good as they come with the fiddle as she helps lay the emotion down on each track. Putting her in the center of the stage is a nice touch to showcase her talents. Rhythmically, Albers and Saenz keep the show going nonstop. Put them all together and you have the makings of a super star band. Their set was only 30 minutes, the shortest set of the night. But those 30 minutes, in those 30 minutes, they made an impact. I may be a tad biased being that I completely fell in love with album from the second it hit my ears. The people around me had asked if I knew the band personally because I sang every word of every song. Truth is, they're just fun to follow on social media and make you feel like you have known them from the college days. The future of the Lubbock sound and Texas country is in great hands if this is what we have to look forward to in the next few years. 1 album and 1 EP into their musical careers, I think its safe to say that Flatland Cavalry is well on their way to being a headlining act. Look for them in the coming months to become a major staple in country radio. Their latest single is already in the top 30, so I highly suggest getting that album as soon as possible! Also, make sure to follow them on Facebook Flatland Cavalry, Twitter @FlatlandCavalry and their Instagram @FlatlandCavalry. Aaron Aguirre is the Main Contributor at Texas Music Talk. "A Place to discuss and promote Texas Country, coming live from South Texas". To hear more about his thoughts on music, make sure to follow along with his social media.